Middle Preclassic (900 - 300 BC) This was the end of the Jaredites and the beginning of the Nephites, Mulekites and Lamanites. Late Preclassic (250 BC - AD 250) Most of the Book of Mormon narrative occurred during this era. Early to Middle Classic (AD 300 - 600) This was the end of the Nephites and the fluorescence of the Lamanites, Teotihuacan apogee. Late Classic (AD 600 - 900) Maya fluorescence. 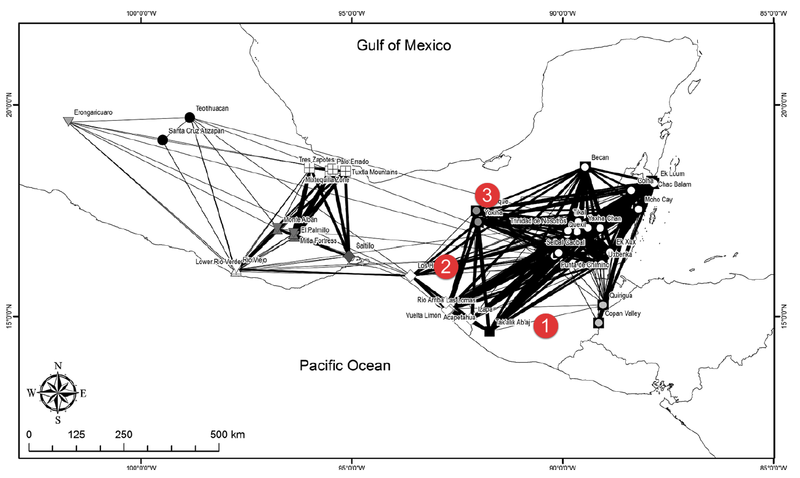 Early Postclassic (AD 900 - 1200) Widespread collapse, Toltec resurgence. Late Postclassic (AD 1200 - 1520) Aztec empire. These maps are based on large data sets derived from hundreds of individual archaeological investigations, so the data is difficult to impugn. There is bias toward sites that have had lithic analysis performed, but almost everyone nowadays does lithics when they dig a site. The fascinating results generally corroborate the January 2016 Book of Mormon Lands Map. This is the Golitko/Feinman map of obsidian sources. 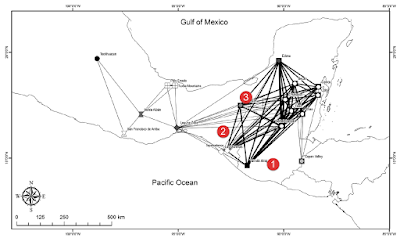 And this is their map of trading activity in the Middle Preclassic (900 - 300 BC) with the proposed city of Nephi (Kaminaljuyu - See the article "Kaminaljuyu") #1, John L. Sorenson's proposed Zarahemla (Santa Rosa) #2, and Garth Norman's proposed Zarahemla (Nueva Esperanza - Calatraba) #3 identified. Darker lines represent stronger trading relationships. People were trading between points hundreds of kilometers distant from each other. The Isthmus of Tehuantepec was a cultural boundary. 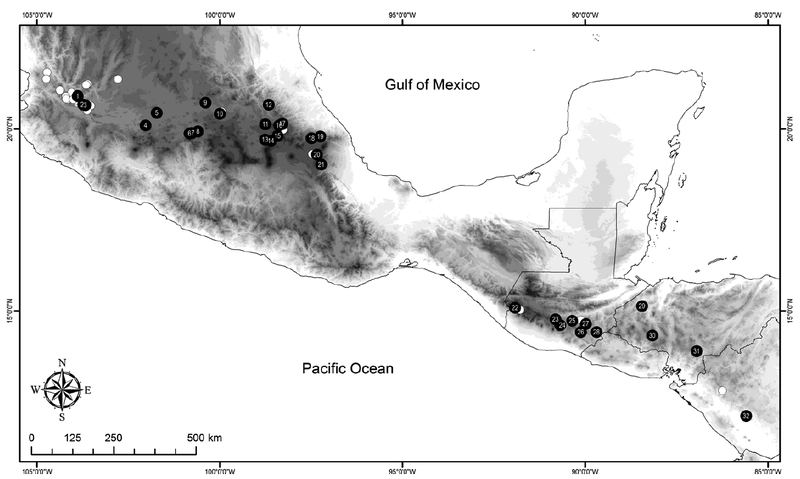 Olmec influence was stronger in the Mezcalapa - Grijalva drainage basin than in the Usumacinta basin. People moved between highland Guatemala and the Maya lowlands via the Salama Valley and the Pasion River drainage. 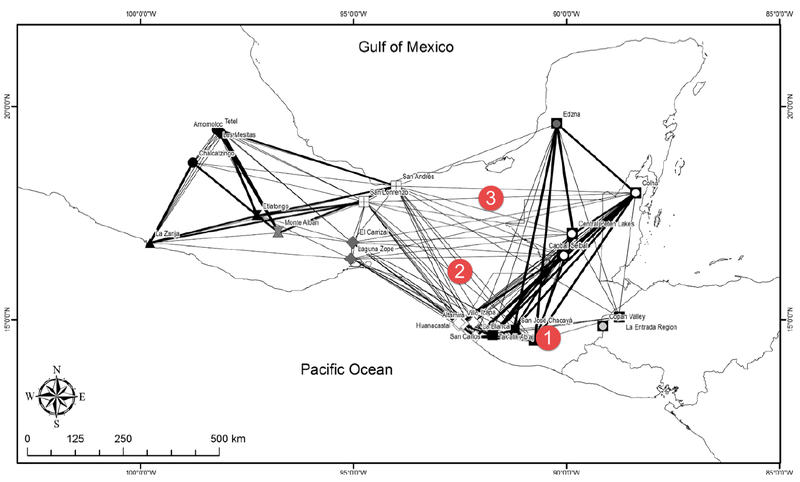 The Pacific coast of Chiapas (Soconusco) was a very active trade corridor. The Tuxtla Mountains region was important. Movement between the proposed land of first inheritance along the Pacific coast of Chiapas and the proposed land of Nephi in highland Guatemala is well attested. The proposed land northward/land southward boundary along the Coatzacoalcos works well with this data. The isolation narrative where the Nephites in Nephi and the Mulekites in Zarahemla were unaware of each other's existence during this time period works for Norman's Zarahemla. It is contradicted by the data for Sorenson's Zarahemla. The Coriantumr as a stranger narrative where no one among the Mulekites could read his stone stela during this time period works to some extent for Norman's Zarahemla. It is contradicted by the data for Sorenson's Zarahemla. The Jaredites fought their final battle in the Tuxtla Mountain region near the end of this time period. Moving on to the Late Preclassic (250 BC - AD 250) the map looks very different. The Mezcalapa - Grijalva drainage had become marginalized into a hinterland. Not much happening along the Gulf Coast or Yucatan. Highland Guatemala continued strong ties with the Maya lowlands including the Caribbean coast. The Pacific coast of Chiapas (Soconosco) was still an active trade corridor. Kaminaljuyu had declined in importance. The Maya west around Palenque had come on strong. Most of the action was east of the Isthmus of Tehuantepec. Major activity between the Usumacinta and the Caribbean. The Mezcalapa - Grijalva drainage, the Gulf Coast, and Yucatan were big blank spots on the map according to the January 2016 Book of Mormon Lands Model. 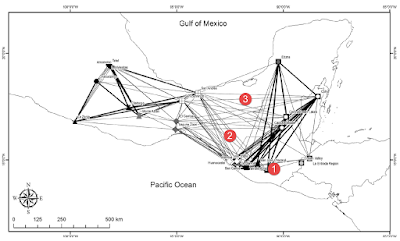 Travel and communication between the greater land of Nephi (highland Guatemala) and the greater land of Zarahemla (southern Maya lowlands) had become routine. Lamanites in large numbers lived in former Nephite lands in the land southward. Zarahemla (Palenque region) rose in importance. The Nephites, Mulekites and Lamanites were beginning to settle the land northward, but most of the action was still in the land southward. Settlements were located from the central Sidon corridor to the east sea. The Maya were ascending toward apogee. The Valley of Oaxaca was coming on strong. 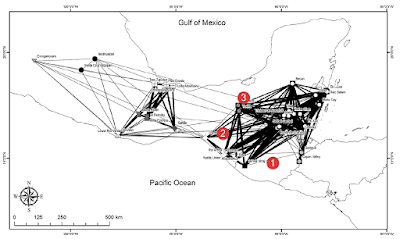 Teotihuacan was an influence across the entire region. The upper Mezcalapa - Grijalva was experiencing a resurgence, although the middle and lower reaches of the drainage system remained a hinterland. Still not much along the Gulf Coast or in Yucatan. The Tuxtla Mountains area had become important again. 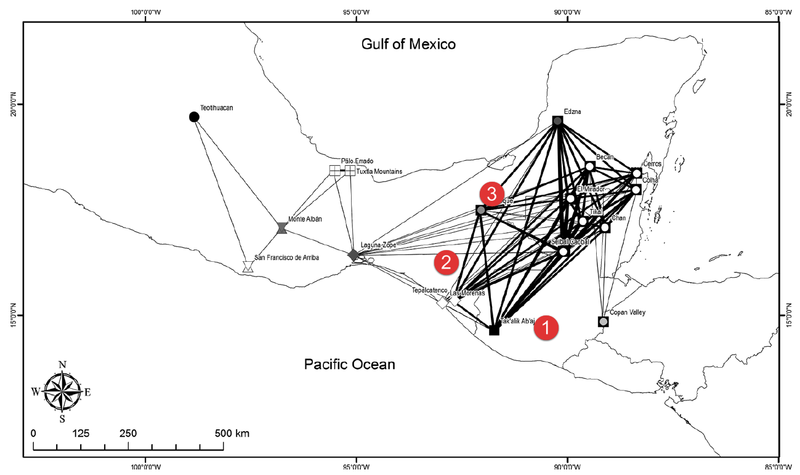 The Pacific coast of Chiapas remained a major communication route. The area around Los Horcones became strategic. The Nephites established a significant presence in the city of Desolation (Los Horcones - Tonala area). From there they went to the land of Cumorah (Tuxtla Mountains area). The Nephites could not flee northward past Cumorah because Teotihuacan blocked their escape. They were caught in a vise. Major blank spots on the Nephite map were the Gulf Coast and Yucatan. Any of the three possible Zarahemlas would fit the data during this time period. Conclusion: Norman's proposed Zarahemla is the only location that fits the obsidian trade pattern data well in all three time periods. The January 2016 Book of Mormon Lands Map uses Norman's Zarahemla. This data strongly corroborates our proposed Book of Mormon map at many points and on many levels.